» Youth Empowerment: Excelling In Times Of Recession. Salimo-Wits Leadership Initiative hosted the SWLC training on Saturday 18th March, 2017 in Ijemo, Ojo Local Government Area, Lagos State; with the theme ‘Exceling In Times Of Recession.’ Arrival and registration of participants at the venue started about 12:20pm. The program commenced at 1:12 pm with opening prayers and rendition of the National anthem. A short video titled: “Beyond Limits” attracted different contributions and comments from the participants. The first Training session was facilitated by Ambassador Daniel Tega Ogomigo. He started his by defining learning as the bridge between ignorance and knowledge. He described recession as a global issue. He said that overcoming recession requires a change in mindset and perspective. The speaker shared the story of Kunle Soriyan and Nick Vujicic, to inspire the participants. He outlined the strategies to overcome recession. He advised the participants to be determined, choose the right association and make no excuses. The main speaker Ambassador Ewere Kingsley commenced his presentation by describing recession as a difficult time in the economy of a nation. He explained that recession is a time when people are unemployed. The speaker urged the audience to see recession as an opportunity for promotion and advancement. He rounded off by urging the participants to take responsibility and commit themselves to service. On behalf of the President Founder of Salimo-Wits Foundation, Ambassador Owoyemi Emmanuel encouraged the participants to utilize the information gained from the program for their personal transformation. Talent display by various upcoming acts: Ekatte Show, comedian Sholexy Baba, Poetic Andrew and Fame Dance Squad performed to the admiration of the audience. Lucky participants won free recharge cards and leadership books. The March Edition of SWLC Training was concluded with Photo session at 4:10 pm. 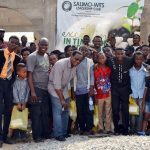 The SWLC training is the signature training programme of the Salimo-Wits Leadership Initiative; organized three times a year for in-school and out-of-school youths. The rebranded training for 2017 will be hosted in various LGA’s & LCDA’s across Lagos State.